A fishing fly is a hook that has been dressed with pieces of feathers, fur, thread, and other materials to resemble a literal fly or some other small insect or fish. Fishing flies are tied in over 5,000 patterns and sizes, and each has a specific name. The "Cosmo Gordon," for example, is a fishing fly that was made for salmon fishing in England around 1900 and is named for the legendary angler. The "Seth Green American Trout Fly" is named for a conservationist who, in the nineteenth century, restocked the rivers in New England with shad. The "Green Peacock" and the "Silver Grey" are named for their general appearance and coloring. Still others, like the mayfly, caddisfly, or stonefly resemble the insects for which they are named. All varieties of sport fishing depend on the attraction of the fish to the lures. Fishing lures form a large category of artificial devices used to attract the fish's attention and lure it to the hook. Within the range of fishing lures, flies are the most beautiful. The three broad varieties of flies imitating the life cycles of flies and other insects; these are nymphs, wet flies, and dry flies. The nymph stage is the larval form of the insect that lives on stream bottoms. Wet flies are fished from below the surface and may look like dead or drowned bugs or insects that are either hatching themselves or laying their eggs. Dry flies look like insects floating on the water surface; they can resemble two stages in the fly's life cycle; either its first flying days after hatching from the nymph stage or the mature fly landing on the water after having mated. Two other types of flies called streamers or bucktails don't imitate flying insects at all. Instead, they look like minnows, other baitfish, or leeches. Long feathers or hair from deers' tails (bucktails) suggest the shapes of these slender creatures. Fly-makers, usually called tiers, advocate one of two schools. The traditionalists belong to the "match the hatch" school, and they try to make flies that look as much like the real thing as possible. These tiers observe the exact shade of this season's hatchlings along the trout stream and dye their flies to match. Other tiers simply believe the school of attraction. The flies they make may not look like any particular insect but are designed to be flashy or to move interestingly to stimulate the fish's interest. Fishing flies are known to be at least 1,700 years old. In the third century A.D. , Claudius Aelianus describes the Hippouros fly made by Macedonian fly tiers of hooks, red wool, and wax colored feathers from a rooster's wattle. The next writings about fly fishing didn't appear until 1496 when a nun named Dame Juliana Berners wrote The Treatyse of Fysshynge wyth an Angle. She chronicled dozens of patterns of trout flies, suggesting that the years between Aelianus's observations and hers were filled with productive fly tying. Wet and dry flies and nymphs were all created and perfected in Europe and migrated to the New World with European colonists. However, streamers and bucktails are American developments. Fishing flies have been an acknowledged art form for about 200 years. Late in the nineteenth century, fishing became an absolute craze in the British Isles, and dry flies were a part of this rage. Purists began to imitate nature's perfection, and some of the most beautiful and collectible specimens of artificial fly date from this era. Emphasis shifted around the 1920s when wet flies became more popular and were sometimes made with as many as 20 different kinds of feathers. After World War II, the availability of plastics and synthetics changed fly-tying interests again toward the attraction school of fly design, and enthusiasm for saltwater fishing also stimulated creation of new types of flies. Designs of flies have diversified as sportsmen's interests in different fish have changed and even as the environment has caused shifts in the kinds of fish available. The different types of flies also require fishing at faster or slower speeds and copying the darting, diving, or twitching motions of the real-life insect or the dead drift of the dry fly; skill at manipulating the line and knowledge of the behaviors of both bait and prey are definitely parts of the art, history, and science of fly fishing. There are four broad classes of materials used in fly-tying. Metal parts include hooks and lead wire to add weight; tiers purchase these from suppliers. Synthetic materials include plastics, poly-yarn with a silicon dressing, foam, and gold and silver mylar. Fabrics and threads are part of the tier's supply arsenal and are typically sewing thread, embroidery floss, and crochet thread; wool and burlap; and synthetics like chenille. Natural materials consist of many types of fur (rabbit, fox, seal, and mink), hair (elk, caribou, and deer), different types of fur or hair from various parts or the bodies of these animals and especially their under fur, and feathers (chicken, peacock, and marabou, among many), again from different parts of the bodies of these birds. Other incidental materials like beeswax, dyes, head cement (to coat the several wraps of thread that represent the head of the insect), and paint for eyes are used in tiny amounts. At least 10,000 published fly patterns fill tiers' catalogs, and their names range from pure poetry to those that sound like members of the World Wrestling Federation. Flies that imitate nature can be miniature works of art that are tied, dyed, and painted in meticulous detail, like the "Lew Oatman's Brook Trout" fly that has tiny yellow and red spots of paint touched along its sides. Tiers in the realistic school rightly consider themselves artists. Tiers in the attraction school may go for simpler, more colorful materials including bits of plastic or metallic flash; they also tend to advocate flashier names for their creations. The "Mickey Finn" fly is devilishly detailed in its construction and ridiculously garish and yet this is among the most popular classic salmon flies. Designs of flies use bits of feather and fur tied to the hook to look like the segmented bodies of insects. The basic segments of a dry fly are the long and stiff tail, the body, the hackle (a flayed section of feathers that looks like legs touching the water), and outstretched wings. A class of dry fly called the emerger fly rides on the water with its tail sunk below the surface; iridescent material is used to design the tail to resemble an egg sack. On a wet fly, the hackle is sparse, and the wing is folded back over the body. Nymphs, streamers, and bucktails have soft tail and body material, which is sometimes wrapped around lead to make them sink more quickly. They also have long, soft wings often made of marabou feathers that make the silhouettes like minnows. Essential tools of the fly tier are dextrous fingers, patience, excellent eyesight, creativity, and ability to visualize the spacing of the fly's segments as he or she ties from the tail (hook bend) toward the head (hook eye). The tools of the workbench consist of a special, y-shaped bobbin for holding a spool of thread, fine scissors, and a vise. A rotary vise is especially useful for turning the fly during the process. The tier assembles a collection of materials specific to the type of fly, for example, a "Royal Coachman," which is an attractor dry fly with a red floss body, iridescent green collars made of peacock herl (part of the peacock feather below the eye that appears flat brown until light strikes tiny, curled fibers on the edges of the feather's barbules that are bright green), white hair for the wings, and brown feathers for the pseudo-insect's hackle or legs. A right-handed tier will mount the hook (of the correct size and weight) in the vise with the eye to the right and the bent hook to the left. The y-shaped bobbin has a spool of thread clasped between the two branches of the "Y," and the sewing floss is threaded through the long leg of the "Y." It is held in tension in this devise but releases easily when pulled as the bobbin unit is either circled around the fly in a stationary vise or held while the vise itself rotates. To create a secure working platform, the tier ties the thread near the eye of the hook and wraps thread around the hook all along its shank to the beginning of the bend in the hook and back toward the eye. To make the tail, four to six feather barbules (barbs that are the individual strands in a bird's feather) are tied close to the curved end of the hook with several wraps of thread that are drawn tight. Where the tail meets the main part of the body, a collar of peacock herl is tied on. Several wraps of thread fix this collar snugly to shank of the hook. The body is made with wraps of red floss. The red floss is extended toward the eye until about 60% of the length of the hook shank is covered. Another collar of peacock herl is wrapped around the hook to the right of the wrapped body. The wings are created from a tuft of white hair from a calf s tail or other suitable material. The hairs must be even at the tips; the hairs are dropped in a hair stacker—a tube-within-a-tube that is tapped so all the hair tips are lined up. The tier pinches the squared hairs between the fingers and ties them to the hook with several thread wraps. The bundle of hair is split into two wings and figure-eight wraps of thread hold the two wings apart and angled up from the body. A tannish brown chicken feather from a chicken that has been specially bred to produce neck feathers with hard, uniform barbules is selected for the hackle—the bug's legs. The quill end of the feather is stripped of soft feather barbules near the base. The center quill is wrapped around the fly to the right (eye end) of the wing attachment. The curving of the quill causes the barbules to flay out. A few wraps of thread fasten the quill tightly. 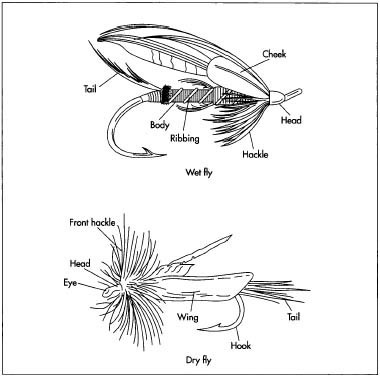 When the fly is cast on the water later, the tips of the stiff feather barbules of the hackle will touch the water, support the fly by surface-water tension, and look from under the water surface to the unsuspecting fish like insect legs. The head is finished with three to five wraps of thread. Sometimes the head is coated with head cement to protect the threads. The tier is ready for his next fly. If he or she chooses to make the leech-like "Woolie Bugger" as his next specimen, the tier will again assemble the needed materials. Unlike the "Royal Coachman," a dry fly that perches on the water surface, the "Woolie Bugger" is a bottom dwelling fly that looks like a succulent leech. To make the "Woolie Bugger" sink, the tier begins this fly by twisting two or three wraps of lead wire around the hook near the head end to make it heavier. A marabou feather is selected to imitate the leech body; when dry, the marabou feather is soft and fluffy, but when saturated in the stream, it forms a sleek leech. Alternatively, the tier may use chenille for the body and webby hackle material to make the "Woolie Bugger." The thread wrap is applied to the weighted hook, and construction of the fly proceeds similarly to the method described above. The tier's judgment, visual appreciation, and sense of touch are the controlling features in the quality of the handmade fly. The ultimate quality control assessment will be rendered by a trout, bass, or salmon who senses an invader in his territory or a tasty treat to line its belly. There are no byproducts from the hand tying of fishing flies. After materials are assembled, many varieties of flies can be made from similar supplies. Waste consists mostly of fine bits of thread, fur, and feathers. Fishing fly designs use bits of feather and fur tied to the hook to look like the segmented bodies of insects. The basic segments of a dry fly are the long and stiff tail, the body, the hackle (a flayed section of feathers that looks like legs touching the water), and out-stretched wings. On a wet fly, the hackle is sparse, and the wing is folded back over the body. Nymphs, streamers, and bucktails have soft tail and body material, which is sometimes wrapped around lead to make them sink more quickly. They also have long, soft wings often made of marabou feathers that make the silhouettes like minnows. The tier uses a special, y-shaped bobbin for holding a spool of thread, fine scissors, and a vise. A rotary vise is especially useful for turning the fly during the process. Different materials are used depending on the type of fly. preoccupation to wile away the days until the streams thaw and the fish run. The future is also promising for fly tiers who dream of seeing their names in print; shelves of books on fly fishing and fly tying fill book stores and also help fishing hobbyists pass the dreary, fishing-free days. Historic interest in hand-tied flies has also become a mini-industry with museums and flies on Internet auction sites. Collectors of fishing flies value them by the person who tied the fly. The products of master tiers are artworks without signatures. Carrie Stevens of Maine (1882-1972) was acknowledged as a master tier, and she marked her flies with a tiny red band on the head of the fly. Other tiers' works must be identified by original paper backings or envelopes with the tier's name. Whether parts of a prized collection or residents in a tackle box, hand-tied fishing flies experience secure futures that would be the envy of their natural counterparts. Leonard, J. Edson. The Essential Fly Tier. Englewood Cliffs, NJ: Prentice-Hall, Inc., 1976. Neff, Sid. "Fishing Tackle: Beautiful Tools of Sport." In The Encyclopedia of Collectibles: Dogs to Fishing Tackle. Alexandria, VA: Time-Life Books, 1978. Shaw, Helen. Fly-Tying. New York: Nick Lyons Books, 1987. Toth, Mike. The Complete Idiot's Guide to Fishing Basics. New York: Alpha Books, 1997. Whitlock, Dave. L. L. Bean Fly Fishing for Bass Handbook. New York: Nick Lyons Books, 1988. Zahner, Don, ed. Fly Fisherman's Complete Guide to Fishing with the Fly Rod. New York: Ziff-Davis Publishing Company, 1978. Raymond, Steve. "The best of flies are those that can catch fish and the imagination." Sports Illustrated (July 2, 1984): 76. Wright, Leonard W. Jr. "The all-American fly: why has this classic lure stood the test of time? Because it works." Field & Stream (November 1995): 62+. American Museum of Fly Fishing. 1998. http://www.amff.com/ (June 28, 1999). Cabelas Inc.1999. http://www.cabelas.com/ (June 28, 1999). The Virtual Flyshop.1994-1999. http://www.flyshop.com/ (June 28, 1999).